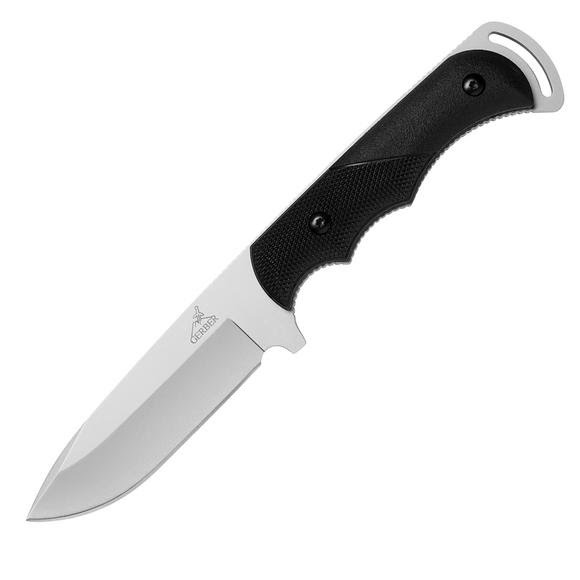 Gerber's Freeman Guide Fixed Blade Knife is the quintessential field knife for hunters. Gerber &apos;s Freeman Guide Fixed Blade Knife is the quintessential field knife for hunters. Stainless steel drop point full fine edge blade. TacHide onlay provides a sure grip. Large finger grooves for use with gloves. Wear resistant nylon sheath included. The tang is the part of the knife where the blade stops and the handle starts. There are many different terms used to describe what kind of tang a knife has, because the strength and other characteristics of the knife depend on the tang format. A full tang knife has a tang that goes the length of the handle at full width, and you can see the tang spine itself because the handle slabs are afixed to each side. This is the strongest tang format. To save weight, the maker can taper the tang so it gets thinner as it goes back into the handle; this is appropriately enough called a tapered tang. If the tang disappears into the handle itself, it&apos;s called a hidden tang. If the tang thins out considerably once it goes into the handle, it&apos;s called a stick tang.